I'm kind of embarrassed to admit, but I have never made stuffing from scratch. With so much other food prep to do on Thanksgiving, it's just been easier for me to buy the boxed mixes to save time. My in-laws hosted Thanksgiving dinner last year and the stuffing was out of this world good. Jason and I couldn't stop talking about how good it was, even on the drive home. I vowed that this year, I didn't care what else I had going on, I was making my own dang stuffing. I found this Raisin Walnut Stuffing recipe on Golden Blossom Honey and was pretty intrigued with the ingredients. What really sold me was how little prep I actually had to do to put it together, so it wasn't going to take up a lot of extra kitchen time on Thanksgiving. 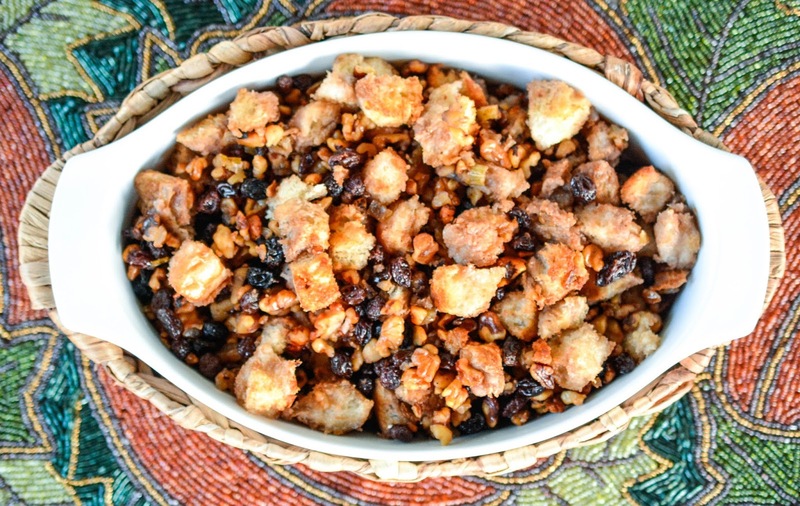 There are so many wonderful textures in this dish: crispy bread bits, crunchy walnuts, and soft raisins, onions and celery. This recipe is going to be a family favorite for years to come! Do you make your entire Thanksgiving meal from scratch, or do you sneak in a few store bought items to save time? Who wants to spend more time than necessary in the kitchen when everyone will have all the food gobbled down in 20 minutes anyway? Dang, that looks really delicious! I've never made it from scratch either. You made it sound fairly easy. I buy a cake for the holiday every-year. I am sure the family enjoys it too! That looks so good. I make stuffing every year. I've never tried making it like this before. That looks interesting - different than any stuffing I've seen before. Don't feel bad - I've never made stuffing either - homemade or boxed!! My mom has always fixed it - I need to get her recipe so that one day I can make it!! My husband's family had a completely different way of making dressing, and it took a little getting used to - but it was good in it's own way. My husband doesn't have that recipe either. His dad always fixed it and he passed away a few years ago, so don't know if we'll ever get it. :( I do know he used stale hushpuppies as the base instead of bread. Stale hushpuppies sound awesome as a base! I am always for trying out of the box recipes like that. Except one time my mom made a cranberry relish stuffing that was just plain nasty. I have never told anyone that I hated a dish before, just quietly scooped whatever I didn't like into the trash. That stuffing she made though, I simply said "Don't ever make this again!" lol. It was that bad! Stuffing is definitely one of the best parts of holiday meals. I need to make this as a twist on our usual stuffing recipes. I love making homemade stuffing from scratch! I'll have to try this recipe though, it looks great. Oh that would make a delicious addition to the Thanksgiving meal. The flavors sound wonderful. Oh yum! Now that looks good! I am definitely adding this to my Thansgiving dinner! That looks delicious! I love walnuts! This looks like a great addition to any meal! Thanks for the recipe! Your stuffing looks like the best one I will ever have. I'm sharing the recipe with my sister. We'll be hosting our family's Thanksgiving dinner this year. That's so true! 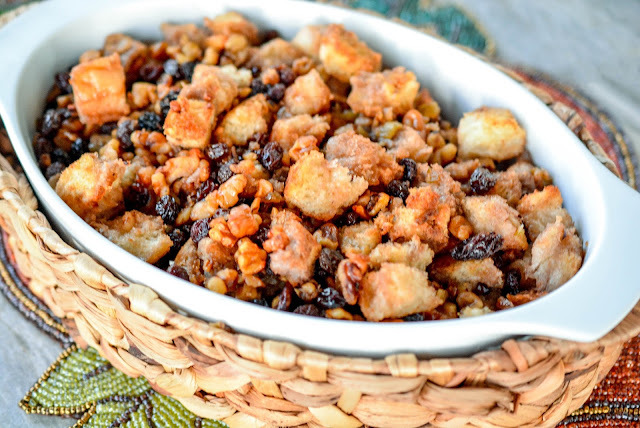 Thanksgiving isn't complete without an amazing stuffing! This one looks so delicious! I am not huge fan of raisins but I think I could try this for sure. I usually make everything from scratch just the way mama and grandma use to make it all. Down to the gravy and pie crust. fresh and yummy stuffing, Theresa...I have been thinking of cooking a great meal this Thanksgiving but I will be out of the country..
Stuffing does seem like a must for any Thanksgiving meal. I love that walnuts are in this one. How delish! This recipe looks delicious! I've never had stuffing like that! I have had dressing and Stove Top, but I've never had stuffing like this before! I think I want to make this for Thanksgiving this year. My husband is addicted to walnuts! I love this brand of honey. Truthfully, I don't think I've ever made my own stuffing either. You've got me curious now. Great-looking dish - has an unique appeal. I love honey, so I will have to check into it. I never knew how versatile honey was. That is a gorgeous stuffing recipe! This looks and sounds like a stuffing recipe my house would eat up! Very unique recipe! Oh my this stuffing looks so delicious and easy to make. I will have to try this out for the holidays. I am sure it will be a big hit. Walnut stuffing? Well that is new...I bet that will be crunchy!